American scientists believe they face a challenging environment and the vast majority of them support the idea that participation in policy debates and engagement with citizens and journalists is necessary to further their work and careers. Most scientists see an interested public: 71% of AAAS scientists believe the public has either some or a lot of interest in their specialty area. Many scientists see debates over scientific research findings in the media: 53% of AAAS scientists say there is a lot or some debate in the news about their field. A sizable share of scientists believe careers can be advanced by media coverage of their work and social media use: 43% of AAAS scientists say it is important or very important for scientists in their specialty to get coverage of their work in news media, up from 37% who said that in a 2009 survey. Some 22% described it as either “very important” (4%) or “important” (18%) for career advancement in their discipline to promote their findings on social media such as Facebook or Twitter. Still, a majority of AAAS scientists say it is not too or not at all important for career advancement to have their research covered in the news (56%), and 77% say it is not too or not at all important for career advancement to promote their findings on social media. At the same time, most scientists believe that science news coverage can pose problems for science: 79% of scientists believe it is a major problem for science that news reports don’t distinguish between well-founded and not well-founded scientific findings. Further, 52% of scientists say that simplification of scientific findings is a major problem for science in general. These findings come at a time when science topics are increasingly part of the public debate. Pew Research findings from this survey reported last month showed an overall drop among AAAS scientists in how they rate the state of science in general and their particular scientific field. Scientists also express concerns about the precarious state of research funding, some of the influences on how funding is allocated, and difficulties they feel hinder the capacity of science disciplines to attract the best talent to the field. 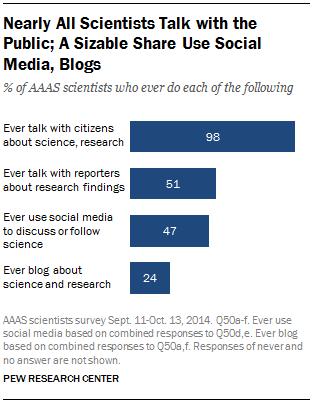 How scientists are engaging: Half talk to reporters and 47% use social media. Nearly all the AAAS scientists (98%) say they have some level of interaction with citizens at least from time to time, and 51% have at least some contact with reporters about research findings. In addition, nearly half of AAAS scientists – 47% – use social media to talk about science or read about scientific developments at least some of the time. 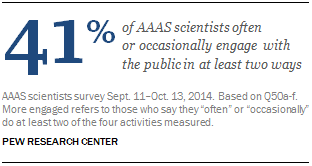 Some 24% of these AAAS scientists blog about science and research. The scientists who are most likely to be involved in public activities show distinct patterns by age, by the level of public debate and public interest they perceive in their specialty, and by discipline. Virtually all scientists engage with citizens. Mid-career and older scientists are especially likely to speak to reporters. Younger scientists are more likely to use social media. And blogging is something that equally spans the generations under age 65. There is also evidence in the survey that the most engaged often use multiple methods and platforms to connect with the public. In other words, those who want to engage tend to do so in multiple ways. 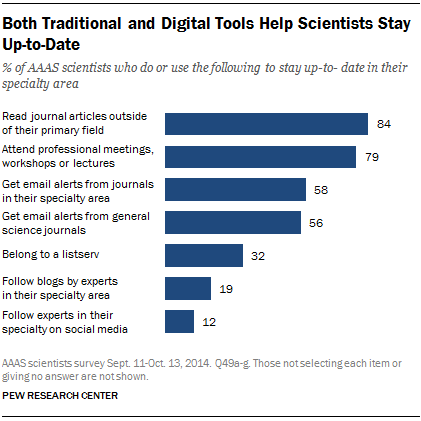 Some 41% of AAAS scientists report that they “often” or “occasionally” do at least two of these four activities: 1) talk with non-experts about science topics, 2) talk with the media, 3) use social media or 4) blog. Nearly half, 48%, do one of these four activities either often or occasionally, and 11% do none of these on an “often” or “occasional” basis. Those who are more engaged by this metric are slightly younger; 46% of those ages 18 to 49 and 44% of those ages 50 to 64 are more engaged, compared with 33% among those ages 65 and older. A somewhat larger share of women (44%) than men (39%) report doing at least two of these activities on a more frequent basis. Traditional information and peer networking activities are the most common ways scientists stay up-to-date. However, digital methods are now a common part of the learning toolkit for many scientists. Fully 84% of AAAS scientists read journal articles outside of their primary fields or scientific discipline. In addition, 79% say they attend professional meetings, workshops and lectures. At the same time, digital communications are also a common part of the learning activities of scientists as they connect with peers: 58% get email alerts from journals in their specialty; 56% get emails from general science journals; 32% belong to email listservs; 19% follow blogs by experts their fields; and 12% follow tweets or other postings in social media by experts in their field. This report is based on a survey of American scientists who are connected to the American Association for the Advancement of Science (AAAS). It explores the ways in which scientists interact with citizens and journalists and their reasons for doing so. This is the second of several reports analyzing the data from two surveys: this canvassing of AAAS scientists and a companion survey of U.S. adults. The first report was released last month and it focused on a comparison of the general public and AAAS scientists as a whole. Follow-up reports planned for later this year will analyze views of the general public in more detail, especially by political, religious and demographic groups. The connection between people’s science knowledge and their views will also be explored. The survey of scientists was conducted online with a random sample of 3,748 U.S.-based members of the American Association for the Advancement of Science (AAAS) from Sept. 11 to Oct. 13, 2014. AAAS is the world’s largest general scientific society, and includes members from all scientific fields. Founded in 1848, AAAS publishes Science, one of the most widely circulated peer-reviewed scientific journals in the world. Membership in AAAS is open to all. The survey was conducted under the direction of Princeton Survey Research Associates International. Further details on the methodology are in Appendix A at the end of this report.